Every time the sons ask what’s for dinner and I rattle off the menu that includes fritters, I always get somebody asking exactly what’s a fritter (again) and whys it called a ‘fritter’ exactly. Like I tell the boys, I’m gonna have to be honest. I don’t really know. What I DO know is that for me, a good fritter is one where our favorite veggies are seasoned, battered, and fried up with love into a crispy, golden patty that begs to be eaten. They won’t be denied. We’ve shared our famous zucchini fritters, and now we’re back with another equally tried and tasty version. Sweet corn kernels and cheddar cheese are the stars. They’re backed up with some green peppers and a handful of spices for a show stealing side dish. 1. If using fresh corn, bring a large pot of water to a boil. Add the shucked and cleaned corn to the water and boil for 3 minutes. Remove from water. Cut the kernels from ears of corn and then scrape the cobs with a table knife to release all the milk. Catch this milk in a bowl and add to the batter. In a large bowl, use a fork to stir together the dry ingredients (flour, sugar, chili powder, if using, salt, and pepper) until evenly incorporated, and set aside. 2. In another bowl, stir together the corn, corn milk, bell pepper, eggs, water and cheese. Add the wet ingredients into the dry bowl, all at once. Stir just until batter is evenly moistened. Stir in the melted butter. 3.Pour the oil into a large skillet, up to about a 1/4 inch deep. Heat the skillet over medium heat until it registers 350 degrees on a deep-frying thermometer. Using a serving spoon and working in batches to avoid crowding, drop spoonfuls of batter into the hot oil. This will make about 16 fritters total. Pan fry on the first side until golden brown and crisp, about 2 minutes. Turn once and fry until golden brown on the second side, about 2 minutes more. Remove cooked fritters from the pan and set on stacked paper towels to drain off excess oil. Season the fritters with salt, to taste. 4. If needed, you can keep the first batches of fritters warm in an oven at 200 degrees while you finish frying the rest. 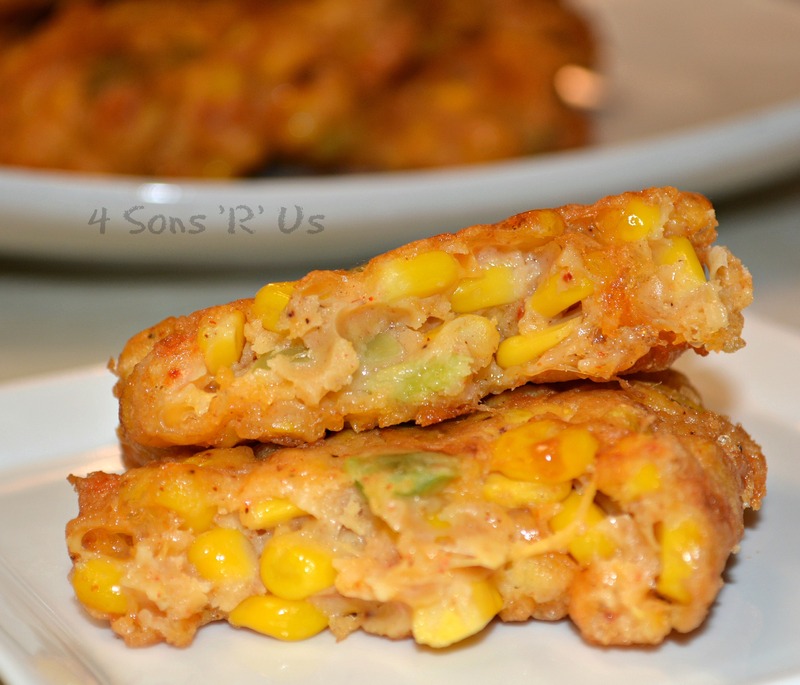 Serve all the cooked fritters warm, at once. Welcome to Fiesta Friday and thanks so much for bringing these gorgeous fritters to the Fiesta. Cheese and corn would be right up my alley. Great ingredients and would go down with anything. I’d love to eat them with a salad and make the meal completely meatless.